When I was a child, I used to regularly freak myself out by the thought that one day I would no longer exist. How could I – my consciousness – simply disappear from the world, when to me, at least, it had always been there? Something about the disappearance of my self terrified me. Looking back on it, it seems a little silly, since I won’t actually have the experience of not being conscious when it happens. But that sense of self – a sense that “I” exist in some fundamental, immutable way – is something pretty basic to the human experience. As an adult, I’ve come to realize that it’s exactly that sense of the self as a concrete, identifiable thing that makes us suffer so much. And that the more we can release our grip on it, accept the “self” as a more fluid concept of ever-changing consciousness, the happier we’ll be. Think about it. Much of our suffering comes from either regretting the past or worrying about the future. We regret the past because of a sense that “I” did something wrong – as if “I” were one immutable being to be constantly judged and evaluated. In fact, all of those judgments – of ourselves and of others – come from an assumption of a core “self” that we tend to see as good or bad, deserving of praise or blame. If there were no solid, core self, the judgments would lose a lot of their force. We might not like something we (or someone else) said or did, but that doesn’t have to entail a judgment about who we (or they) are. It’s a lot easier to let that go and move on. The same for our worries about the future. What if I don’t get what I want – money, fame or love, for example? If “I” am not such a solid entity that I can judge as successful, attractive, or lovable, then not being those things is no longer such a tragedy. “I” am not a failure – maybe I just didn’t get something I wanted this time. Too much sense of self actually makes it difficult for us to act and interact with others in the world: the more “self-conscious” we are the more paralyzed we feel. Of course, it’s normal to have some sense of self, and even necessary for healthy functioning. As psychologist Rick Hanson explains in his book, Buddha’s Brain: The Practical Neuroscience of Happiness, Love and Wisdom, which I’ve written about before here, we’re born with a sense of self, which develops over time. This was important for evolutionary purposes, Hanson explains, since a sense of self is important to reading others and expressing ones own self effectively, which was necessary to form alliances, mate and keep children alive. Today, a sense of self is still necessary to having a sense of continuity over time, forming relationships and taking responsibility for one’s actions. Indeed, Canadian philosopher Charles Taylor describes the modern sense of self as defined by how we judge actions and define a good life — our moral beliefs and values. But that concept of self is not solid; it can change and develop over time. In the brain, “the self is continually constructed, deconstructed, and constructed again,” says Hanson, forming a conscious experience that seems coherent and continuous, but isn’t really. The self is ultimately composed of a myriad of causes and conditions, and continues to evolve in response to new causes and conditions, including those we create. Surrounding ourselves by loving people, living a healthy lifestyle, and practicing compassion, for example. 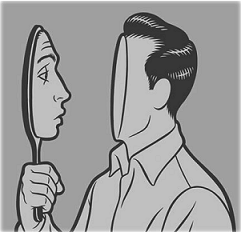 The problem arises when we get caught up in seeing ourselves, or others, as fixed entities – bad or good, valuable or worthless. That’s all a fabrication of our minds. Unfortunately, our culture encourages that. Politicians talk of other people as “evil,” and may brand whole groups of people, or cultures, as “barbaric,” backward or violent, often as a way of seeking or maintaining power. Companies try to sell us products by suggesting we’ll be someone better, more successful or more desirable if we have them. And on a personal level, we routinely apply those sorts of labels to ourselves. How often have you called yourself “stupid,” “lazy” or worse, simply for making a mistake or not getting something done? from a neurological standpoint, the everyday feeling of being a unified self is an utter illusion: the apparently coherent and solid “I” is actually built from many subsystems and sub-subsystems over the course of development, with no fixed center, and the fundamental sense that there is a subject of experience is fabricated from myriad, disparate moments of subjectivity. I probably wouldn’t have been comforted by that as a child, when I was freaking out about the fact that one day “I” would not exist. But as an adult, I see it as hopeful. Whatever or whoever we are we’re always changing, and have a lot of power to shape that process. We can dislike something we or someone else did, but let those judgments land lightly. They’re something to learn from and use to influence our future choices. But in most cases, “I” – or its eventual disappearance — is not something anyone needs to suffer over. This entry was posted in coaching, happiness, psychology and tagged Buddha's Brain, Buddhism, Charles Taylor, coaching, judgments, neuroscience, psychology, Rick Hanson, self, self consciousness. Bookmark the permalink.